Yesterday was the Feast of the Purification of the Blessed Virgin, wherein 40 days after His birth, Our Lord was presented at the Temple, thus signifying His entrance into His Church, and also the humble obedience of the Blessed Virgin, who presented herself according to God’s Law to be purified, even though she had absolutely no need of such since her virginity was totally preserved for her entire life. I was struck by the icon above because it is one of the very few icons I have seen wherein the subject’s face is radiating joy. Icons often look quite sad, or at minimum extremely solemn. 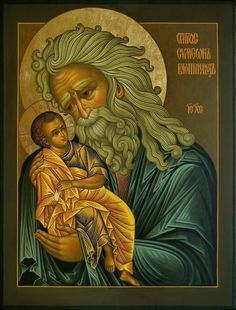 In this icon, the joy of Simeon, the God-Receiver, tears welling in his eyes and a gentle smile on his lips as he looks upon God Incarnate, is most moving. St. Simeon, the God-Receiver, is an image of all of us who receive Our Lord into our own physical embrace every time we receive the Eucharist. Would that we all recognize and know Him as He is brought to us at the Communion rail, like Simeon knew Him on the steps of the Temple; would that we all hold and cradle Our Lord with the care and awe that St. Simeon did when we receive Him in the Eucharist; and would that we all rejoice like St. Simeon at each and every meeting with Our Lord. This entry was posted in Uncategorized on February 3, ARSH 2015 by Ann Barnhardt.